Clinton And Other Dems Did Some Cherry-Picking, Fact Checkers Say : It's All Politics While independent watchdogs aren't slamming Democrats for fudging the facts, they are finding some problems with what was said Wednesday by the former president and others on the convention stage in Charlotte, N.C.
Former President Bill Clinton at the Democratic National Convention in Charlotte, N.C., Wednesday night. 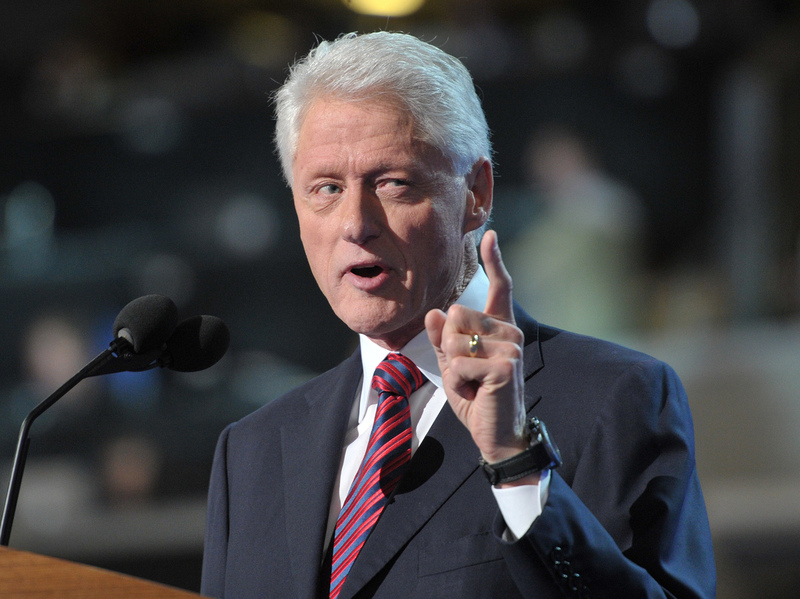 -- "When former President Bill Clinton took the stage at the Democratic National Convention on Wednesday, he portrayed President Barack Obama as a pragmatic compromiser who has been stymied at every turn by Republicans," The Associated Press writes this morning. "There was no mention of the role that the president and the Democrats have played in grinding compromise to a halt on some of the most important issues facing the country. "That was among the lines by the former president and others Wednesday that either cherry-picked facts or mischaracterized the opposition." -- PolitiFact gives Clinton a "true" rating for saying that there have been 42 million private sector jobs created since 1961 when Democrats were in the White House, vs. 24 million under Republicans (a period over which Republicans held the White House for five more years than Democrats). It also rated as "true" Clinton's "claim that Obama's stimulus program 'cut taxes for 95 percent of the American people.' "
But PolitiFact dinged Delaware Gov. Jack Markell for saying that Republican presidential nominee Mitt Romney "likes to fire people." According to PolitiFact, "that cherry-picks what Romney actually said, which was a comment on the advantage of being able to switch health insurance companies if a provider isn't giving good service. We rated Markell's claim False." It adds that "the worst we could fault him for was a suggestion that President Obama's Affordable Care Act was responsible for bringing down the rate of increase in health care spending, when the fact is that the law's main provisions have yet to take effect." -- But The Washington Post's The Fact Checker takes fairly strong issue with Clinton's statement that Obama's deficit reduction plan "uses the bipartisan commission's balanced approach. It reduces the deficit by more than $4 trillion." "The repeated claim that Obama's budget reduces the deficit by $4 trillion is simply not accurate. By the administration's math, you have nearly $3.8 trillion in spending cuts, compared to $1.5 trillion in tax increases (letting the Bush tax cuts expire for high-income Americans). Presto, $1 of tax increases for every $2.50 of spending cuts. "But virtually no serious budget analyst agreed with this accounting. The $4 trillion figure, for instance, includes counting some $1 trillion in cuts reached a year ago in budget negotiations with Congress. So no matter who is the president, the savings are already in the bank. Moreover, the administration is also counting $848 billion in phantom savings from winding down the wars in Iraq and Afghanistan, even though the administration had long made clear those wars would end." You can find all our posts about fact checks of the Republican and Democratic conventions here.